We enclose a copy of the June 26 preliminary injunction ordered entered by the U.S. District Court for the Northern District of California in this case together with a copy of Apple's U.S. Patent No. 8,086,604 (the '604 patent'). With the posting of the requisite bond, the order is now in effect. For the foregoing reasons, Apple's motion for a perliminary injuction is GRANTED. Accordingly, Samsung Electronics Co., Ltd.; Samsung Electronics America, Inc.; and Samsung Telecommunications America, LLC; its officers, partners, agents, servants, emplotyees, attornyes, subsidiaries, and those acting in concert with any of them, are enjoined for making, using, offering to sell, or selling within the Unite States, or importing into the United States, Samsung's Glaxy Nexus and any product that is no more than colorably different from the specified product that infringes on U.S. Patent No. 8,086,604. As the italicized language provides, the order applies not only to the named Samsung entities, but also to anyone "acting in concert" with them. Apple thus believes that the order extends to you because you may be selling, offering to sell, or importing Samsung's Galaxy Nexus. 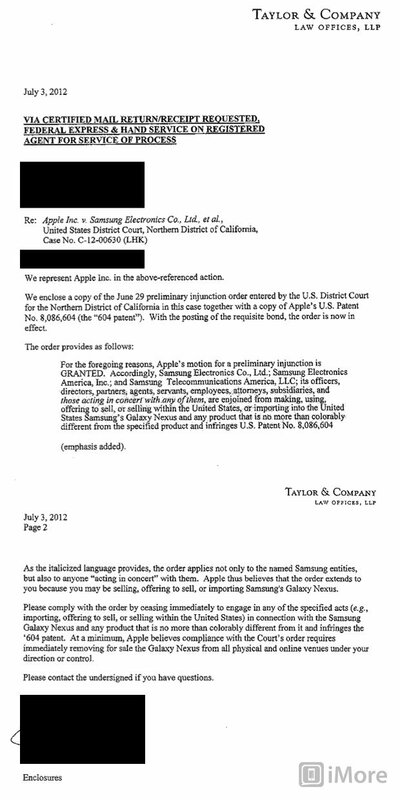 Please comply with the order by ceasing immediately to engage in any of the specified acts (e.g., importing, offering to sell, or selling within the United States) in connection with the Samsung Galaxy Nexus and any product that is no more than colorably different from it and embodies the '604 patent's design. At a minimum, Apple believes compliance with the Court's order requires immediately removing for sale the Galaxy Nexus from all physical and online venues under your direction or control. The letter was accompanied by almost 100 pages containing the Unites States District Court ruling referenced in the letter. Clearly, Apple believes that when and if they're granted injunctions with this specific language, they can and will go after retailers selling the enjoined product(s). 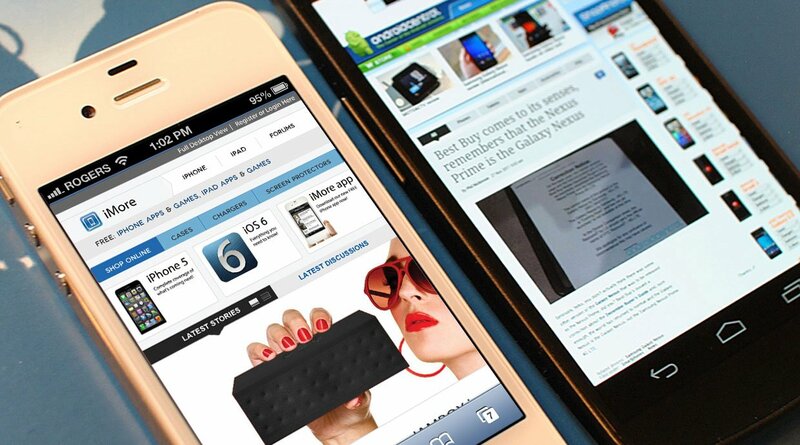 Given the long, multinational history of skirmishes between Apple and Samsung, it's also clearly far from over. It's our understanding large retailers like Best Buy and Walmart had been in the process of complying with the order, Apple demand letters notwithstanding. Others may not have been so inclined. For more, see our initial report on the story and Alex Dobie's coverage on our Mobile Nations sibling site, Android Central.